The points below illustrate specific requirements of Table 1 (as listed above) and how Sy-Klone’s RESPA® Cab Filtration Systems can help you achieve compliance. 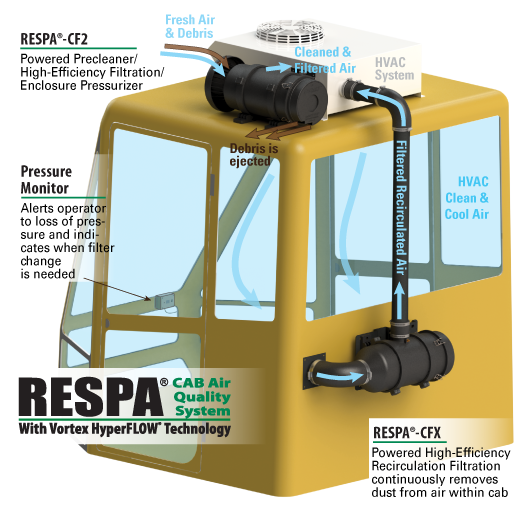 The RESPA-CF2 positively pressurizes with a clean airflow delivery into the cab. The RESPA-CF2 also offers air precleaning and high-efficiency, self-cleaning filtration. Minimizing air leakage through door jams, grooves, and other entry points mean that the RESPA-CF2 has better ability to provide enough fresh air to achieve and maintain cabin pressure throughout the maintenance cycle. Sy-Klone’s high-efficiency filtration keeps dust out of the HVAC system, keeping heating and evaporator coils cleaner, leading to a better functioning HVAC heating/cooling performance. Standard MERV 16 filtration removes 95% particulate 0.3-10µ particulate size range. Sy-Klone also offers HEPA/H13 filtration efficiency, as well. Recirculation filtration also a valuable component for removing dust that does enter the cab. Click here to learn more about Sy-Klone’s RESPA recirculation products. If you would like more information on becoming Table 1 Compliant, contact sales@sy-klone.com.